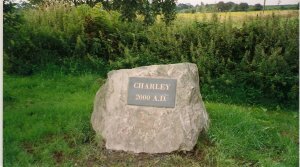 In keeping with the geological structure of the area, Charley Parish Council installed two large rocks to mark the Millennium, one at the Abbey Road/Oaks Road crossroad and the second at Copt Oak. The Pump for use of residents at Copt Oak was originally sited by the traffic lights at Copt Oak. Follow the link for the story on 'The Re-siting of Charley Parish Pump'. 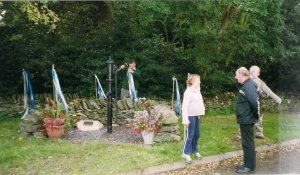 The pump was refurbished and re-sited for safety reasons and a ceremony was held on 26th September 2004. 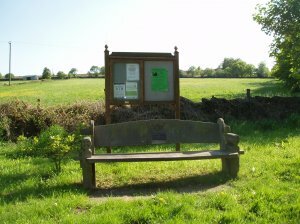 Charley Parish Council maintains six benches in various parts of the Parish, three of which are simple 'plank and post' type. The bench at the Abbey Road/Oaks Road crossroad was replaced and dedicated to the memory of Mr Norman Hall, a one-time member of the Parish Council. It stands in front of one of three notice boards in the Parish, the others being at Copt Oak and the entrance to the car park of the Oaks Storer Hall. Parish Council news and information is posted on the board at the Abbey Road/oaks Road cross roads.